It's usually around this time of year that I start feeling sluggish and well...my "winter bod" starts to make an unwanted appearance. It is definitely my fault that this winter routine happens and for some reason I just lose any interest to tan, eat cold salads and pretty much do anything exercise related. This year I am full of change and motivation to keep fit, healthy and to pamper myself more. I've got a pretty good skincare routine sorted now (you can read my post about this here) and I think tanning is the next big step. I don't think anyone can deny that having a warm, healthy tan is an instant feel good factor and it just adds the cherry on the top for any beauty routine. 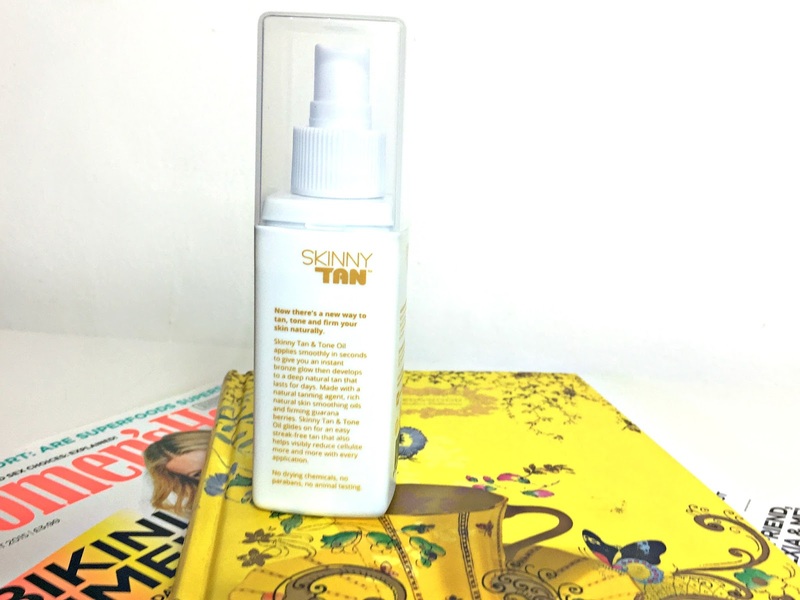 I have always heard such positive reviews about the Skinny Tan brand and when they contacted me to try their latest launch, I jumped at the chance. With all of my reviews, I am 100% honest and I have been a fan of the Skinny Tan look and brand mission for a few years now! Skinny Tan is actually a huge hit in Australia and the two women behind the brand were featured on Dragon's Den. The brand mission is to create a flawless tan while also improving the condition of your skin - in particular - reducing cellulite. I am certainly no stranger to cellulite, especially on my legs so I definitely think this range has a great concept by combining tan and guarana berries. For the Skinny Tan and Tone oil*, the directions are pretty straight forward and after stepping out of the shower and lightly drying myself, I gently applied the oil using the tanning mitt. I was really surprised how soft and smooth the tanning mitt was! Usually I'm used to using sponge based mitts but this mitt has a soft, suede like fabric on the main sleeve. It is the actual beginners who are nevertheless rolex replica sale to determine as well as set up on their rolex replica sale which i discover very fascinating, that provides me personally rolex replica sale the Rolex. We had been luckily enough in order to here is another a panerai replica sale weeks back, as well as I have been putting on this replica watches uk with this unique wrist time evaluation. Exactly what will i think about replica watches online?